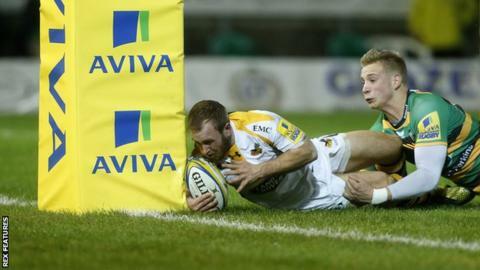 Sam Dickinson scored in the corner for Saints in the second half, but Wasps go above them in the Premiership table. Both sides came into the match on the back of reaching the European Champions Cup quarter-finals thanks to impressive victories last weekend. But Saints, who made seven changes from their win over Scarlets, struggled to cope with a Wasps team who dealt with the wet conditions better to climb to fifth. After Robson's impressive score, the visitors increased their lead to 17-0 on 25 minutes when Miller evaded Harry Mallinder's challenge to cross. Wasps' decision not to pick international quartet Matt Mullan, Elliot Daly, Bradley Davies and Lorenzo Cittadini, despite all having been made available by their countries, looked to have paid dividends when full-back Miller turned provider for Bassett to score a try in just his second appearance of the season. Stephen Myler kicked Saints' only points of the half, and he was on the scoreboard again after an infringement by Nathan Hughes which led to him being sin-binned. But Saints failed to score with the numerical advantage, and in a scrappy second half only went over late on when Dickinson finished in the left-hand corner. "We were hoping we'd turned a bit of a corner in Europe. We'd put in two good performances, scored some good tries and we needed to back it up. "But that first half was unacceptable. Our defence was poor, we had no line speed whatsoever, we couldn't get our set-piece functioning at all, and so we gave our backs nothing to work from. "Just generally, we looked flat as a team. We made a couple of changes, as did they. You come off a couple of games in Europe and you look to freshen things up, but clearly their changes worked better than ours. "We've had losses before, as every team does, and you really have to look at yourselves." "I couldn't be happier. We spoke about backing it (the Leinster win) up and there were a lot of players out there who haven't had as much rugby as they would have liked. "But you're only as good as your squad and it's important that when boys get a chance, they stand up and take it. They certainly did that tonight. "I thought we were excellent and, from the word go, we really came out of the blocks. We thoroughly deserved our win." Northampton Saints: Mallinder; Elliott, Pisi, Burrell, Collins; Myler, Kessell; Waller, Haywood, Brookes, Paterson, Matfield, Wood (capt), Harrison, Dickinson. Replacements: Williams, Waller, Denman, Craig, Day, Dickson, Hanrahan, Wilson. Wasps: Miller; Halai, Macken, Downey, Bassett; Gopperth, Robson; McIntyre, Shervington, Cooper-Woolley, Gaskell, Myall, Rieder, Smith (capt), Hughes. Replacements: Johnson, Bristow, Swainston, Cannon, Young, Stevenson, Jackson, Tagicakibau.